»Books»When a man is down the enmity ends. When a man is down the enmity ends. Many of the pictures in Liberty’s Victorious Conflict seek to show a gentler side of the great carnage that was WW1. 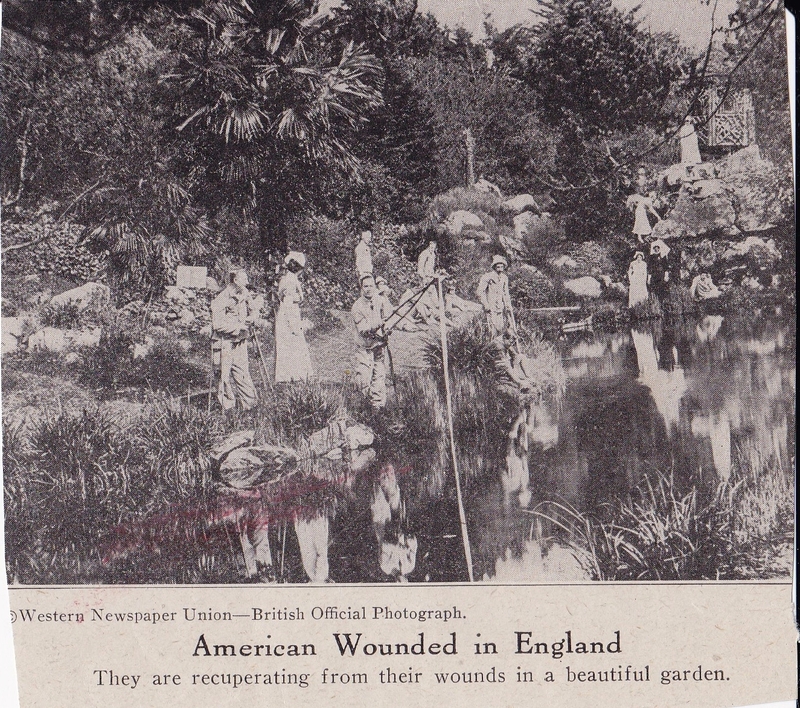 This little grouping features primarily the wounded with Americans recovering in England and Germans being treated by the British or Canadians. The picture above and below both report to show Americans recovering in England. Not much to say about either other than perhaps the authors of the book wanted to communicate the growing bond between the two nations that had developed during WW1. The caption notes that the hospital was donated by an Englishwoman. The fellow on the far left of the picture looks much worse than the other smiling patients being cared for by a nun. I wonder why they dragged all the beds outside to take the shot? The picture was damaged by a kid with a crayon but it’s still an interesting picture of enemies being treated for their wounds. It’s my understanding that when possible the doctors and medical orderlies of both sides treated the wounded without discrimination-at least on the western front. 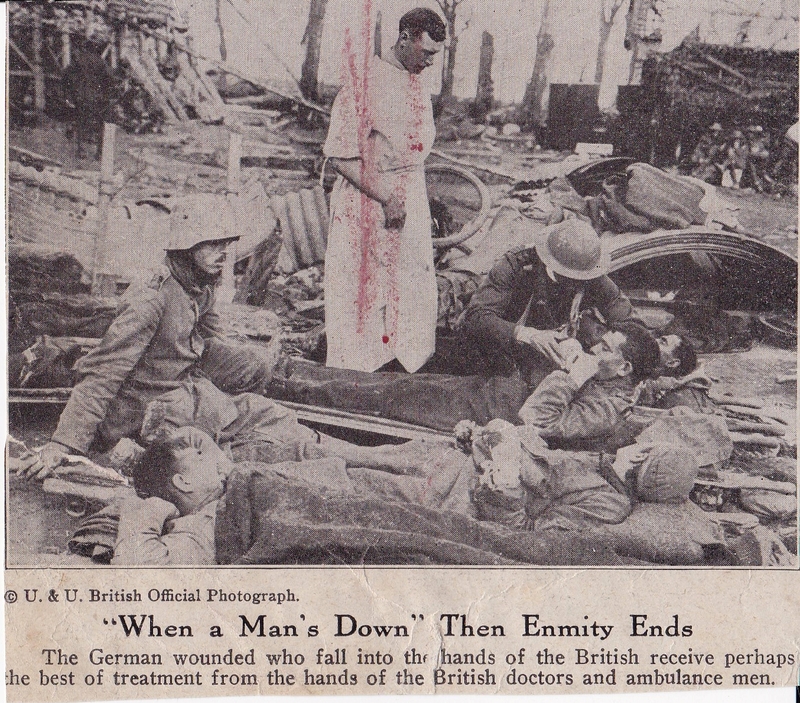 Another picture of German wounded being treated and a British nurse killed in an air raid. I grouped the above two pictures to show the difference in labeling. The picture on the left calls the German a “Fritzie” a nickname like “Jerry” rather than a pejorative. The British on the other hand were usually called “Tommies” by the Germans. The picture on the right however is designed to get an emotional response-a British nurse killed by a “hun” in an air raid. The propaganda machine in Britain and the US consistently referred to the Germans as Huns comparing them to medieval Mongols who terrorized Europe. I believe it was first used when the Germans invaded neutral Belgium a fact that drew Britain into the war and therefore a miscalculation on Germany’s part.